Joshua Segal: It closed circa 1975. Condo complex now there. Perhaps 175ft vertical, chairlift + 2 tows. Tom Kegel: I grew up in Lexington (class of 76) and remember skiing at the Bedford Country Club (1972 -1974 time frame?). There was a chairlift!! On weekends the line to load was longer than the actual length of the lift. The vertical drop was 100-200 ft. at most. I remember very little about the place, I think that there were 2-3 "trails". I do remember that you could see the chairlift from Rt. 3. Here's an "aerial" view from across Rte. 3, looking towards the two former slopes of the ski area. Notice the condo development, and the very, very short length of the trails. Photo by Jeremy Davis. Here's the area today, not much to see. The remains of the golf course are on the left. Betsy McDonough has also confirmed that condos have taken over the area. Ken Larson: One place I remember well is the Bedford Country Club. When I was a boy the area was a dairy farm owned by Paul Little. I went to school with his son David. Originally, there was a rope tow only and most of those who skied there were local kids. The Little's barn still stood at the entrance to the parking area and abandoned farm machinery was evident around the place. Skiing wasn't the only activity there. We also tobogganed there as well. Tobogganing was more thrilling than skiing. It wasn't much of a challenge to ski the open area but the speed and lack of control of the toboggan made for a wild ride. Paul Little eventually sold the farm and the golf course he built on it to Noel Dill and his father, also of Bedford. They made a lot of improvements but were unable to interest local corporations in taking memberships to the golf course as a corporate recreation area. After a short time the effort, which included a really nice restaurant, closed and the land was sold and developed into housing. Steve Elias: I had to surf to your web site to see the Bedford country club ski area! That is where I learned to ski during 76/77 & 77/78 winters. the trail on the left of the photo was the "double-diamond" trail because it required both minimal stopping and turning skills. the ski area was open for sure during winter of 76/77 when i rented wooden skis there and broke one when I skied into a boot-hole in the snow. I remember seeing class of '78 & maybe class of '77 Lexington HS people there at some sort of food/vending area. One rope tow and one lift were active when I was there. John Sherwood: I was astounded to find information on the Bedford Country Club Ski Area on your site. Bedford was one of the places where I learned to ski in the 1970s. 1977 is a year that comes to mind. My parents had recently separated and I remember visiting the ski resort with my mother's new boyfriend, a professor of English literature at Middlesex Community College. My skis were red, and made of wood. My father got them for me at a local ski swap in Bedford. Thanks DAD! For boots, I wore my mother's white leather boots (spray painted black). What I remember most about the resort is falling off the chairlift near the top of the hill. I guess I was a bit too eager to disembark that day. Skiing in Bedford has led to a lifelong fascination with the sport. Last year, I skied at St. Anton in Austria, but you know what, I still remember those early turns in Bedford. Andrea Merva: I grew up in Burlington, MA and remember skiing and sledding in Bedford many weekends. I was born in 1975 and remember going there at least until 1980. I remember the chairlift with about 4 runs that we used to race on. After the area closed, I spent many days sledding there and climbing what seemed to be the steep slope to get a great ride to the pond at the bottom of the hill. The area represents many happy memories for me. David Herald: My memories of the ski area in Bedford date back to the early/mid 60’s when I was 12 or 13. It was known simply as “Little’s” at that time. This was where I learned to ski, back in the bear-trap days. My first linked turns there were probably there around 1963, Christmas vacation week. That was a busy time there if there was good snow. There was one rope tow at that time, on one of the steepest slopes, powered by an old pickup truck that Paul Little would start up after a good snowfall. 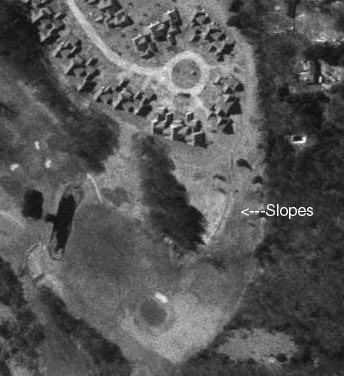 The slopes were located in the middle of Little’s farm. The steep one was to skiers right and the gentle one that he later installed a chairlift on was near Rte 3 to skiers left. The steep slope was shaded by large pines, the snow stayed longer there. In the mid 60’s it was pretty much a local hangout. Just a rope tow, run only after a snowfall, after school and on weekends. I grew up within sight of the slope on the other side of the river, so I’d give the thumbs up or down on the rope tow to friends and we would cross the river, when the ice was safe enough (it seemed to freeze more often back then), and hike the hill even when the tow was not running. We practiced slalom there for Bedford High School Ski Team events. We formed the team around 1965 with the help of Arthur McManus, the BHS physed director. I was in the same class in BHS as Ken Larsen (a contributor above) and David Little. Here’s a little secret - the talented Doug Coombs may have made his very first turns at Little’s, but you’d have to get him to admit it before mentioning it. A few years younger than I, he is a BHS grad also and lived up the street. But that is another story! Steve Bouchard: My name is and I too skiied at Little's Farm in the early 60's. Dave Little was my best friend at the time. The original tow was a rope attached to a truck and it was fired up after a heavy snowfall. I remember thinking how fortunate I was to ski there. I skiied Mars Hill in Maine and Stowe to name a few but I had the most fun at Little's. In the summer we used to work on the farm. They sold their milk to Musgrave's (I think in Billerica). Dave's dad, Paul, was also the town dog catcher and the local official for Weights and Measures.